At this moment in 1980, Bruce Springsteen was atop the Billboard album charts with "The River." 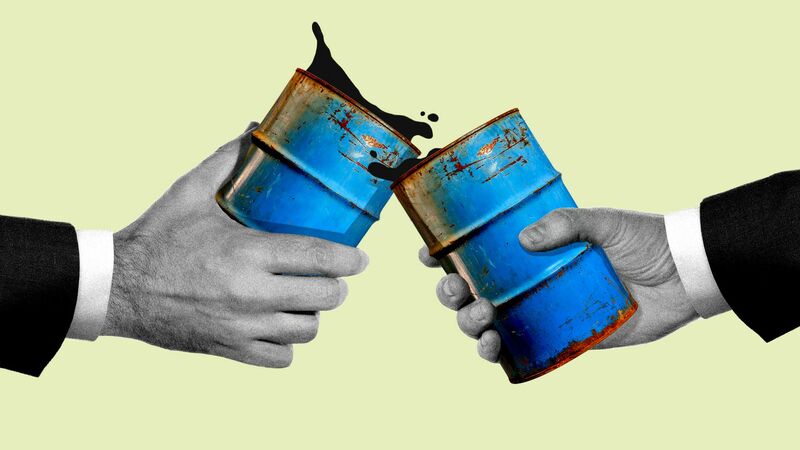 Falling oil prices are bad news for the oil industry — but they're great news for corporations that could use the relief from other expenses, Axios' Courtenay Brown reports. Why it matters: With a tight labor market that's forcing companies to pay more to attract workers, plus the costs of tariffs from President Trump's trade war, oil is one less expense that will cut into companies' profits. "The oil price decline offsets other cost pressures that businesses have," Conrad DeQuadros, an economist at RDQ Economics, tells Axios. Driving the news: U.S. crude oil is recovering slightly in recent days after a record 12 days of consecutive price declines, driven by fears of an oversupply. Background: Companies are already being hit with a triple whammy — higher commodity costs (including oil), a trade war that's making materials more expensive, and rising interest rates. Take Walmart, whose CFO Brett Biggs told analysts in October that the high fuel prices at the time — which played a role in pushing up transportation costs — were a "challenge" for the company this year. Go deeper: Read Courtenay's full piece here. California's deadly and tragic wildfires this month are creating big financial problems and bringing new scrutiny to the state's power companies. The latest: Via the Wall Street Journal late last night, "A California regulator said ... it was expanding a probe of PG&E Corp.’s safety practices to explore the way the company is managed and run, including whether it should be broken up." Threat level: In a special wildfire edition of the Axios Science newsletter, Andrew Freedman reports on reasons there's likely more to come in California and more broadly in the West after the latest in a 13-month string of the deadliest and most destructive blazes the state has ever seen. No single factor — not climate change, forest management or building practices — is responsible for the deadly blazes the state is now seeing, experts tell Axios. Instead, it's their combination that's making an already dicey situation far worse. And the outlook in coming years, as climate change continues, is foreboding. “Fire season in California doesn’t have a well-defined boundary anymore, that’s been true for some time," said Brenda Belongie, a U.S. Forest Service meteorologist. What's happening: Longer-term climate change and population growth are combining to increase wildfire risk in California and more broadly across the American West. Go deeper: Read the full newsletter and subscribe here. "McNamee pledged to be an 'independent arbiter' on FERC and to separate his decisions as a regulator from his previous role at the Department of Energy, where he worked on the bailout plan. He declined, however, to say if he would recuse himself from similar issues at FERC." Arctic drilling: S&P Global Platts looks at Interior Department preparations to lease massive offshore tracts in ecologically sensitive Arctic waters off Alaska's coast. The intrigue: There may not be much industry interest in pursuing leases there. "[S&P Global Platts Analytics' Rene] Santos said that harsh Arctic conditions that will increase drilling costs, coupled with opposition from environmental groups, will likely deter much commercial interest in the Arctic," they report. Uncertainty around federal regulations, especially if Trump is not re-elected, is another variable, the story notes. Congress: The Washington Examiner chatted with lawmakers who see opportunities for targeted bipartisan cooperation on energy legislation next year. An infrastructure package could provide openings in areas such as efficiency in publicly funded projects, grid modernization and EV charging, they report. Electricity is the thing we all need but don’t think about — unless it’s gone or extremely expensive, writes Axios' Amy Harder. Why it matters: While the type of fuel powering America’s electricity has shifted rapidly in the last decade, what matters most to many people is what they pay for their electricity. Unlike the gasoline prices on constant big display, our electricity bills are usually buried in the mail or our email inboxes — or simply set to auto-pay. Driving the news: What we pay can vary wildly based on where we live, the weather, government involvement in electricity markets, and, of course, how much electricity we use. The infographic above shows average electricity bill since 2002 for 4 states — and in the Axios stream there's a drop-down menu to see any state. Quote"With the direct air capture technologies, 10 years ago you would have said that’s just like a fairy tale." Who said it: Princeton University's Stephen Pacala in this new interview with Yale Environment 360. He led a recent National Academies report on development and deployment of negative emissions technologies. "But because of diligent activity by a small number of technical people, there’s been very rapid progress, so much so that knowledgeable people who are not starry-eyed, but just hard-headed, believe that there is a very high probability that a research effort within 10 years would produce direct air capture at less than a dollar a gallon of gasoline."